Nettles, the wild edible and pesky, painful weed that has been a staple of traditionalists and confounding gardeners since the beginning of time, are finally getting their spot on the culinary stage. Nettles are replacing kale as the superfood of the moment, boasting the highest levels of protein and plant-digestible iron of any other green and high in vitamins A, C, and D as well as calcium, potassium, and manganese, according to Janice Schofield’s book Nettles (published in 1978 and unfortunately out of print). So nutritious, if not a little dangerous, these greens are showing up in gourmet shops and farmers’ markets across the country. 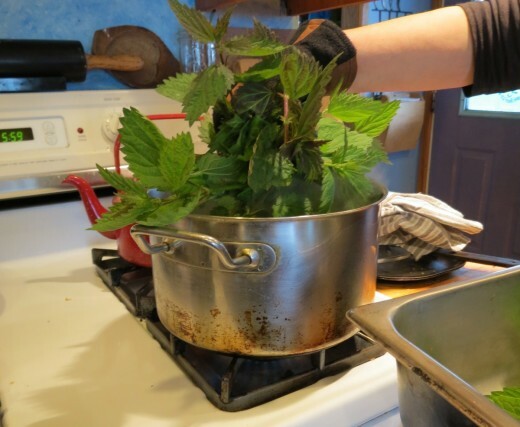 While nettles are tasty in soups, tea, and even pizza, one of our favorite things to do with them is to make pesto or, as we like to call it, nesto. My friends Jenny and Sydney and I have been getting together in the early summer for many years now to make big batches of nesto. We usually make it an afternoon affair, with the kids all suiting up in protective gear and tromping around our nettle patches, filling big wicker laundry baskets and telling their worst stinging nettle stories. 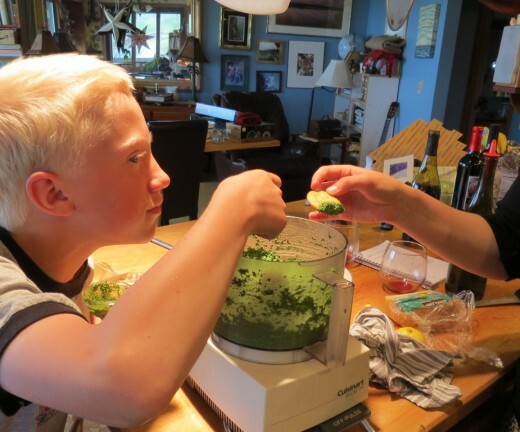 Once our greens are picked, it’s time to head into the kitchen, where we formulate batch after batch, some with no nuts for Jenny’s daughter Lia, some with no cheese for Sydney, and just generally playing around with different ingredients. As we taste test, we sip wine and reminisce about summers past, and before you know it, there is jar after jar of beautiful green goodness. After years of tweaking, we have come up with this version that is always a hit. The flavor of the nettles is fresh and clean, almost cucumbery, and while the pesto does rely on nuts, cheese, and oil for flavor, what I find remarkable is that I don’t miss the basil one bit. 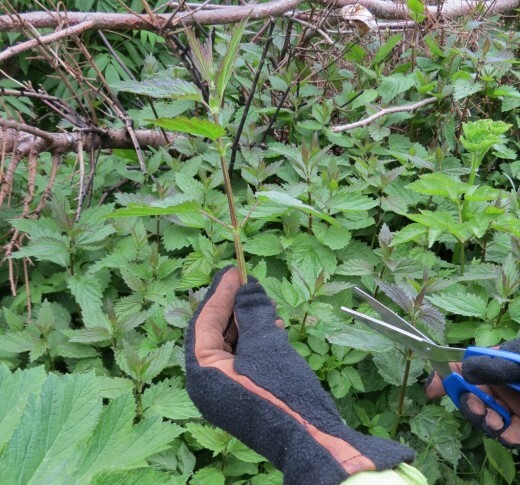 To harvest you want to cut just the top 3 bracts of the nettle plant. 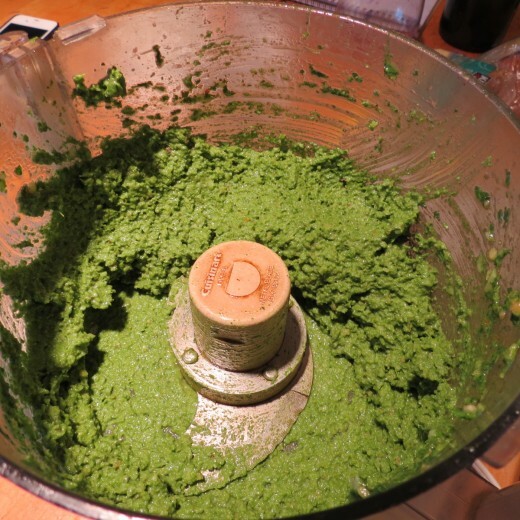 Stinging nettle pesto or nesto. 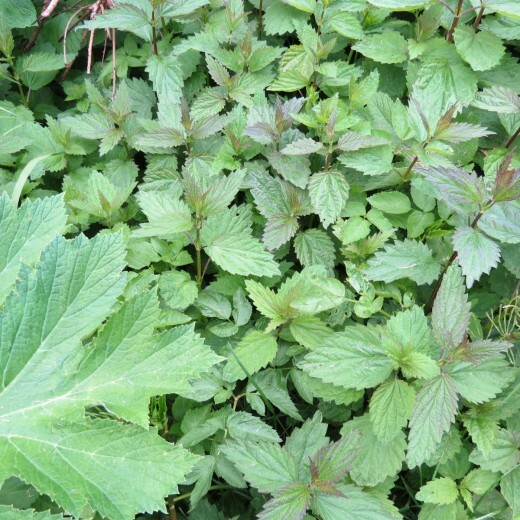 Remove the nettles and place into an ice bath. Squeeze out all the liquid and give the nettles a rough chop. 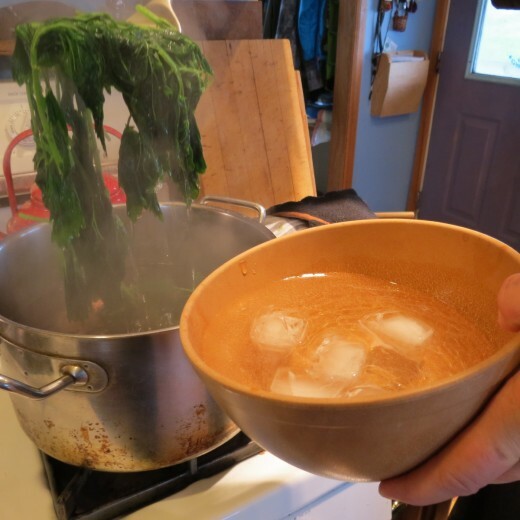 You should have about 3 cups of cooked greens. 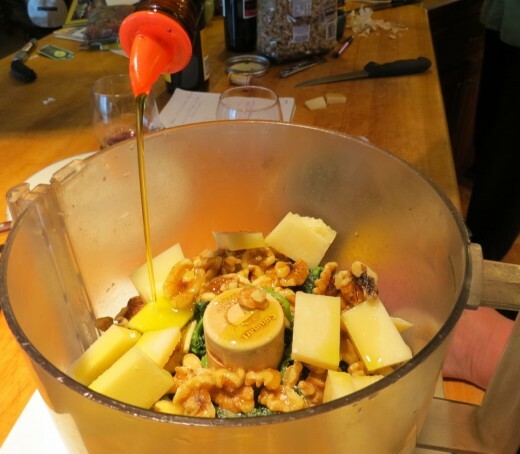 Placing all the ingredients in the food processor to make the nesto. 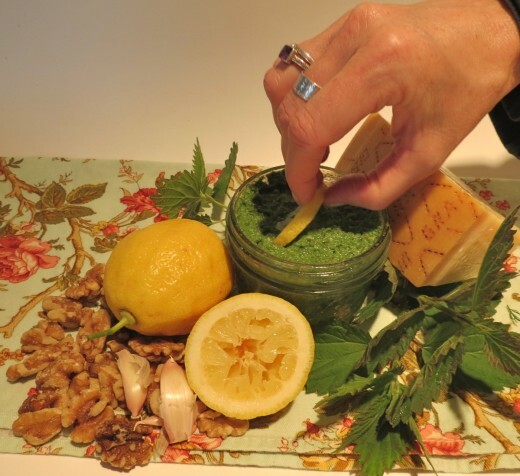 Place the nettles into your food processor along with Parmesan/pecorino romano, walnuts, garlic cloves, lemon juice, kosher salt, freshly ground black pepper, and olive oil. Process to the desired consistency. If things aren’t moving around in there like they should, add a bit more oil. The nesto has come together. You should get enough out of this to pack into four 8-ounce glass jars. Now that we’ve made our pesto and had a glass of wine or two, let us geek out a little more on the attributes of this dangerous and delicious weed. It has, it turns out, quite a past. This prehistoric plant has been in use by humans from the Bronze Age, when they would pound the fibers to make clothing and fashion nets, which get their name from the common term for this irritating wonder of nature. Janice Schofield’s other book, Discovering Wild Plants, tells us also that not only are nettles a true super food, up here in the north they are used traditionally as a spring cleaning for the digestive system, giving them credit as a remedy for the “breakup blues,” a malady that tends to hit just as the ice is breaking up at the end of our long, dark winters. I’ve only recently realized that the rush of warm energy we would feel after these fun afternoons making nesto was from eating the nettles—we used to blame it on the wine. My post on homemade pasta. Carri’s last post was on making bacon truffles. Jenny Coyle, who took pix, is married to my friend, the writer, Dan Coyle, author of The Talent Code, #greatnonfiction. Little Miss Cruciferous is an urban foraging blog—yes, stinging nettles do grow in cities, too. Connie Green’s book The Wild Table: Seasonal Foraged Food and Recipes is a great book to have on your shelf. I really appreciate you letting me romp in your nettle patch, Michael! Also, a big Thanks to Jenny Coyle (and husband Dan) for the invaluable help with this post! (and thank goodness for iphones, just sayin’!) Look for Dan’s latest literary feat, ‘The Little Book of Talent’ out soon …you gotta love any book that tells you to take a nap! i have thought about this a bunch – it must be an amazing coincidence that the most delicious fish just so happens to have a deadly poisonous liver. and i found goose barnacles from spain that sell for $85 for a 4oz tin, where these barnacles only grow on deadly cliffs – again amazing that such a delicious critter grows in such tough locations. and other examples – my sarcasm hinting at the fact that perhaps there is something other than taste that drives these specialties – macho daring, bragging rites, etc. it is much like how i find it amazing that treasured truffles are so hard to find – so are they tasty and coveted so much because they are rare, or are they actually that good? Love the name nesto!! Unfortunately I hardly have seen any nettles here in the area I live at in Colorado (probably too dry), but I know lots of spots in Germany where to pick tons of them. Too bad. The market I work at sells Bhut Jolokia Ghost Peppers both fresh and dried. Those things can put you in the hospital, I’m pretty sure they’re more dangerous than a stinging nettle! I am interested in trying this though, no clue where in Dallas I’d find them though! I recently purchased some nettles at my farmers market and made a pretty similar recipe. However my gf is allergic to nuts of all kinds so we substituted toasted pine nuts. If anyone is interested the nettles from the northwestern Washington state have a taste similar to spinach with a touch of fish flavor. I have been told that other varieties have less of a fishy taste. I also dry the fresh plant on racks to make tea, it is supposed to help with allergies but I have yet to try it. They can be creamed like spinach (with garlic) and eaten with polenta and an egg sunny side up. The water in which they boiled is a great detox liquid – an acquired taste, though.. I had trouble finding any, and when I did, I dried a large amount to put in tea or flavor soups. 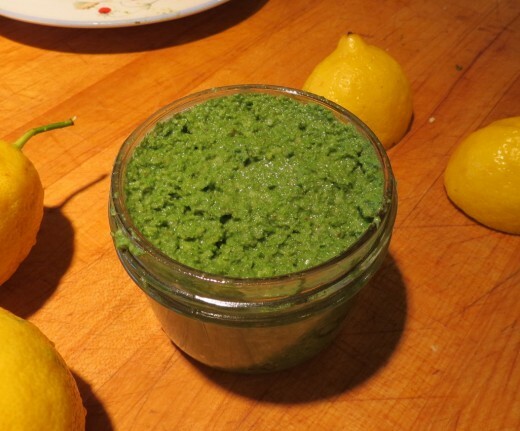 I never thought of making pesto/ nesto, sounds great! Would you consider using dried, or is that sacrilege like basil? Also worth mentioning the many health benefits touted on the web, better than snake oil. I can’t imagine using dried. But I would think any fresh green would work. The greens serves to spread the tasty stuff around. I have seen nettle flour in Finland. They put it in porridge and other pastries I think.